While CODECs, like H.264, H.265, and MJPEG, get a lot of attention, a camera's 'quality' or compression setting has a big impact on overall quality. In this training, we explain what this level is, what options you have and how you should optimize it. With the information presented, the best answer is that it cannot be determined. We used the same camera for each image and simply increased compression for the 'B' image (while keeping everything else the same, including resolution and codec). Regardless of codec used (H.264, H.265, MJPEG, etc. ), all IP cameras offer quality levels, often called 'compression' or 'quantization'. 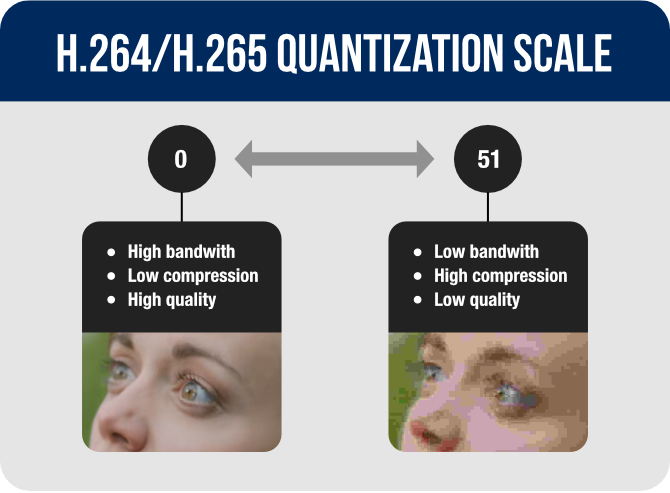 H.264 and H.265 quantization is measured on a standard scale ranging from 0 to 51, with lower numbers meaning less compression, and thus higher quality. If this seems counter intuitive to you, it is understandable, but these are simply the measurements defined in H.264 and H.265 standards. ***** ******, **** *. ***, *. ***, *** *****, *** * *** of *********, * ******'* '*******' ** *********** ******* *** * big ****** ** ******* *******. ** **** ********, ** ******* what **** ***** **, **** ******* *** **** *** *** you ****** ******** **. **** *** *********** *********, *** **** ****** ** **** ** cannot ** **********. ** **** *** **** ****** *** **** image *** ****** ********* *********** *** *** '*' ***** (***** keeping ********** **** *** ****, ********* ********** *** *****). ********** ** ***** **** (*. ***, *. ***, *****, ***. ), *** ** cameras ***** ******* ******, ***** ****** '***********' ** '************'. *. *** *** *. *** ************ ** ******** ** * ******** ***** ranging **** * ** **, **** ***** ******* ******* **** compression, *** **** ****** *******. ** **** ***** ******* ********* to ***, ** ** **************, *** ***** *** ****** *** measurements ******* ** *. *** *** *. *** *********. ******** ***********/***** *** ******* ***** *** *** **** ** *********, but ****** *******. ******** *******/****** *********** *** *** *** **** ****** *******, *** use **** ********* *** ****** ******* ****. *** ***** ***** ***** *** ****** ** ******** ******* ******. In ***** ** **** ****, ** **** ******** **** *** scenes (****** / ****** *** ******* / *******) *** ******** bitrate. *** ************ ****** *** ** **** ********** ** **** scenes ** ******* **** **. *********, ***** ******* *********, **** less ********** *** ******** ** *******. *** ************* *** ******* ******* ******. **** ** *** ***** touch ***** ********, *** ************ **** **** * ****** *** you. *******, **** *** **** ******** ** ************ *******, ************* options *** ********* ** *** ******** ***** ****** ****. **** **** *** ********* *** **********. **** ******* ******* *** use ********** ***** ******* *** **** *********** *** **** *** ******* ******* ******* for *.***/*. *** *****. **** *** *** *** *** *** ***** to ******* ** "***********", **** ****** ******* ***** **** **********/***** bandwidth. ****** ** ****, ** ************* ***** *** ****** ******** the ***** ******** ** ********* ***** *******. ********** ** ***** ** ** ****, **** *********** ** ******* to ~** ** *** ************ *****. *****'* ***** ***** ***** ************ ** *-******, **** *-****** ******* to **** ** * ******** ****** ("*/*-***** ***** **" *****). So ** *-****** *** *** ** ** *** *-****** *** to -*, *-****** **** *** * ******* ** ** ************. This ***** ** ******** ** ******* ************ ** * ******** level, ********* **** ***** *** ***** ** * ***** ***** to ******. *********'* *********** ******** *** ***** *** *****/***** ***, ** * scale ** "******" (**** ***********) ** "*******" (***** ***********), ********** to "******." ***** ******** *** ****** ** ******** ************ ******, ranging **** ~**-**. ***** ******** *** ************* ************ ****** *** the **** ***** **** *. *** *** *.***. **** ************ *********** *** ******** *** **** ********* (***), ***** varies ********* ** ***** ** ******** * ***-*** ******* *****, sometimes **** * ******* *** **** *** (****** ***). *** levels *** ***** ****** *** ************ ***** *** ****** ** targeting, *. *., ** **** ****** **** ****** ************ ***** **, with ******* ********** *** ********** ** *********. *******, ** ******* *** *** ** ******** *** ****, ******* level ** *** ************ ******* *** *** ****, ** ********** is '********', **** ******* ***** ************* ******** ** **** ********* the ****. *** ********, ** *** **** * *** ***** stream *** ** ***/* ******* ** * ***** ****, *** camera *** *** * '****' ******* ***** ***** ** ** easy ** ********. *******, ** *** ****** *** ****** *** and * **** ** ***** ** ***** ** *** ******, it *** **** ** **** **** ** '***' ******* ** maintain *** **** ***/* ******** *** **** ** *********** ** more *********. *** **** ** *** *** ****** ** ***** ********* *****, see ****** ** *** ** *** - ************ *****************. ***** ************ ******** *** ************ ***** ****** ********* ***** ** *** image / ***** / *****. ************, * ****** ************ ***** was **** *** ** ****** *****. **** ***** ******, *** camera ************* ******* *** **********, ********* ** * ****** ************ (thereby ********* **** *********) ** ******* **** * ***** ************ level. ** ** *******, * ****** ** ******* ****** ******* a ******* *** **** ** ****** *******, ***** ****** **** and ***** ** *** ********** *** ***** *******. *** *** is ******** ******* ********* ***** *********** ******* *** ********* *******. *******, ** ******** ********* ******* **** ***** ****** ** *** scene ***** *** ****** **** ** *********, ** **** ******** image ******* ******* *** ** ****. *** *******, ** *** of *** *****, ****** ****** ** ***** ***** ******** ****** blurring/smearing/artifacts ** *** *****, ******* ** *** ******* *** ********** below. ******** ****** ** ********* ******** ** ***** ***** ******. ******* ****** **** *** ******** ***** ******** **** *********** ** ***** *** ***** **************. **********, *** **** ********* ******** **: **** ******* ******* ** necessary ** *** ******'* ***********? *** ***** ***** ** * ********** ******** ****. ******** **** a ************ ***** ** ** ** ** ** **** ** to ** ******** ** ******* **********. ***** *** ******* *** nearly ************* *** *********. *** ***** ***** ******* ** *** ********** ** *** *****. More ******* ****** (**** ** ************) **** ********* ******* **** a ****** ******* ****** **** * ****** ***** (**** * stairwell). *** ******* *** ******** ***** ******** (**** * ****** across ** ************), *** **** ****** ******* ****** *** ******* meaningful *******. ************ ~** ** *** "***** ****":***** ** ***** ** ******* *******, ** **** ***** ** to ***** *** **** ********* ******* ********* *** ***** *******. Many ************* ******* ** **-**, ****** ***** ****** *** ***** ****** ************ *********** ************* **** ******* ** *** ** *********** ******. *** ***** ****** (*** *********):******* ** ***** ******* ******* ********** ** **** ******, ** recommend ***** ****** ** **** ******** ********, ** ***** *** be **** ** ******** ***** ******* ***** *********, ***** ******** remain ***** **** ******* ******. *** **** **** **** **** *********** ** **** ******* ****** tree ***** *** ******. **** ****** **** ******* ********** *****. There *** **** **** ******* ***** *** ******* ** ****** can *********. * ***** *********** ***-**** ** ********* ******* * ***** ******* and **** *** **** **** *** ****** ** *** ** is **** *********. * *** **** ******* **** ********* ******* and **** **** ** ****** *** ******** **** **** ****** it **** ***** ** *** **** ***. **** **** **** quality ******* ** ****. *** **** *** ***** ***** ** capacity ** **** ****.